The MSc in Digital Marketing & Sales is designed to train students to acquire the analytical and business related skills needed to have a successful career in the digital ecosystem. Its pedagogy is built on a transversal vision based on 4 pillars: strategy, technique, design and digital marketing. The programme focuses on themes likes social media marketing, data analytics, digital strategy & content marketing, e-commerce management activities...Besides, the MSc has a strong industry orientation & partnership approach. What determines which year we enter? Whether we do 1 or 2 years? 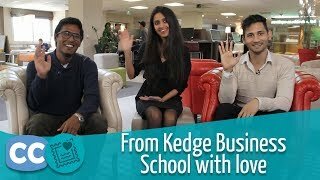 Can you tell me more about the KEDGE Marseille campus in Paris, please? Can you tell us more about the students’ background? Does this program include courses on big data and machine learning? What makes the French tech community unique and different from the US or Chinese tech community? In the Disrupt your Mind seminar, how do you get students to “think outside of the box” as you say when you didn’t even “think outside the box” of this cliché? How does this program address differing privacy laws between the EU and the US? Could I work for luxury brands with this master? Is there a way to specialize? Is this program all about marketing and analytics to sell more stuff online for e-commerce companies? Hi. Is this program right for me if I would like to continue to get a PhD focusing on business evolution in the digital age?